Decanting is one of those elements of wine service that remains mysterious to many drinkers: Which wines need it? How to do it? Is it really even necessary? 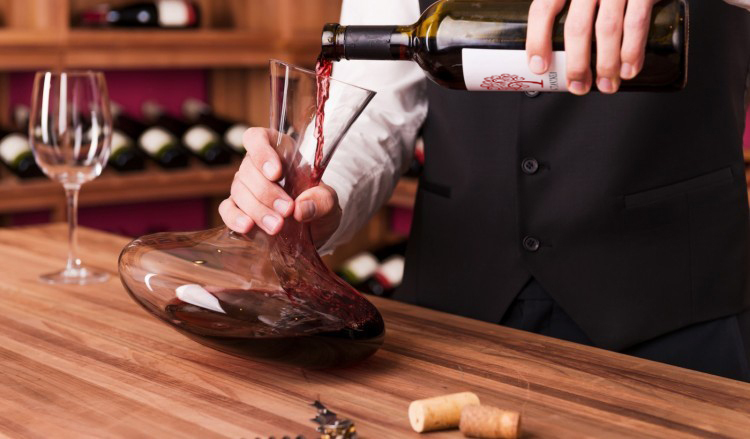 Decanting serves two purposes: to separate a wine from any sediment that may have formed and to aerate a wine in the hope that its aromas and flavors will be more vibrant upon serving. Older red wines naturally produce sediment as they age; the color pigments and tannins bond together and fall out of solution. Stirring up the sediment when pouring will cloud a wine’s appearance and can impart bitter flavors and a gritty texture. – Set the bottle upright for 24 hours or more before drinking, so the sediment can slide to the bottom of the bottle, making it easier to separate. – Locate a decanter or other clean, from which the wine can easily be poured into glasses. – Hold a light under the neck of the bottle; a candle or flashlight works well. – Pour the wine into the decanter slowly and steadily, without stopping; when you get to the bottom half of the bottle, pour even more slowly. – Stop as soon as you see the sediment reach the neck of the bottle, or if the wine’s color becomes cloudy or if you see what looks like specks of dust in the neck. – The wine is now ready to serve!